Flash mob was the craze before planking, and its way more amusing and clever. A horde of seeming random people gather and then suddenly start dancing in sync or doing some other random act such as a pillow fight. Flash mobs began as a form of performance art; to wake people lost in the daze of the city routines and show the nonsense all around us. No one really knows when or where the first Flash mobs were, but a Flash mob in Manhattan in 2003, organised by the magazine Harper's Bazaar, is sometimes claimed to be the first. It was basically a mob on the 9th floor of Macy's gathered around a rug, giving the same answers to the confused shop assistants. Supposedly it said something about conformity. Perhaps this was the first commercial Flash mob, in any case, Bill Wasik, senior editor of Harper's Magazine coined the term "Flash mob" in his blog and for this he definitely gets the credit. In April 2006 silent discos were held in the London Underground stations as people gathered with their portable music devices at a set time and began to dance. 4,000 people participated at London Victoria station flash mob. From here it was not just a YouTube video. The crowd stopped traffic and the police threatened to come in. It was now TV news. This is when advertising agencies and radio stations started creating them as cheap effective advertising. 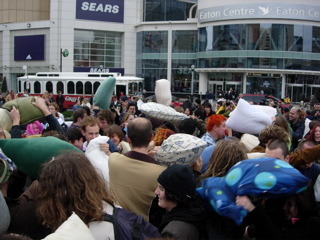 Other massive Flash mobs include Worldwide Pillow Fight Day on March 22, 2008. Over 25 cities participated including; Atlanta, Beirut, Boston, Budapest, Chicago, Copenhagen, Dublin, Houston, Huntsville, London, Los Angeles, Melbourne, New York City, Paris, Shanghai, Stockholm, Sydney, Vancouver, Washington, D.C., and Zurich. Adelaide's Flash mobs have had mixed response. In September 2008 an AFM Flash Mob of Ninjas drew a crowd of 5 at Adelaide University, but reports suggest the beers afterwards were a success. Adelaide Come Out Festival 2011 organised a Flash Mob in Adelaide Railway Station drawing up to a hundred teenagers, but it was simply rehearsed dancing to Kylie Minogue to promote something and get attention. It wasn't performance art. So, how about it South Australia? How should we descend on Rundle Mall- 1000 red Julia bob wigs on pogo-sticks? The roots of Flash mobs are to shine a light on the absurdity of city life and routine. Want to join a Flash mob? There's a website for Adelaide mobbers, Adelaide Flash Mobs. Want to plan your own flash mob? Take it up a level and / or bringing it back to its roots? Covertly gather friends, then get them to social network with their friends. Be surprising, be amusing, be clandestine, be a pioneer. Also, remember if a Flash mob gets political, it's actually a protest. Think performance art and try to make people notice something positive by doing something bizarre. Hi, I'm one of the organisers of the Adelaide Flashmob. Just thought I'd mention that the Ninja flashmob at Adelaide Uni was actually a promotion for our larger (now annual) 'Ninja Raid on Adelaide' event which drew over 100 people that year. The AFM coordinates both 'traditional' flashmobs and more organised events.